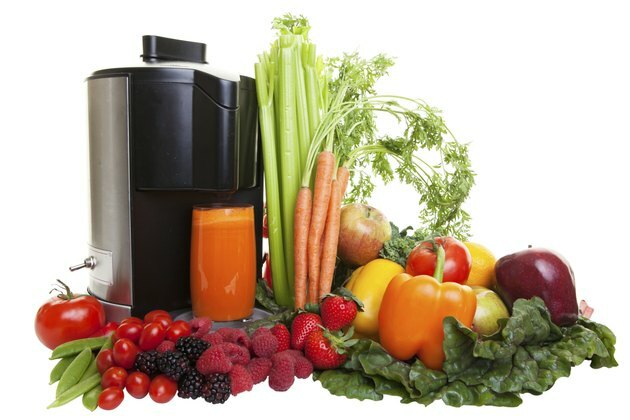 Juicing raw vegetables and fruits can be a valuable addition to an already healthy diet. As with all foods, however, natural juices aren’t miracle cures for any medical condition, and the American Cancer Society reports there’s no scientific evidence that natural juices are any healthier for you than whole foods. In some cases, you may get more health benefits from eating the whole foods instead of liquefying and drinking them. The benefits derived from drinking natural juices depend, in part, on the type of equipment used to make the juice. Centrifugal-force juicers -- the traditional kind sold in many stores -- remove virtually all of the fiber from the raw foods. Fiber is an important nutrient for digestive health that many Americans already consume too little of. However, this type of juicing may have health benefits for people with impaired digestion. Drinking juices made with traditional juicers gives your GI system a timeout while still providing all the vitamins, minerals and phytonutrients of fresh produce, says Dr. Sears Wellness Institute. Fresh juice made using a high-speed blender retains most of the fiber of its raw-food ingredients. Because of the fiber content, blended juices provide a slow release of nutrients into your bloodstream and can help you feel full longer. This may assist with your weight-loss efforts, reducing the number of calories you eat overall. It can also help you manage your blood sugar levels, preventing spikes and crashes that can affect your mood and energy. Increasing your vegetable and fruit consumption can reduce your risk of high blood pressure, heart disease and cancer. However, only 27 percent of Americans meet the daily recommendation of three or more servings of vegetables, and only a third eat the recommended two servings of fruit per day, according to a 2009 report by the Centers for Disease Control and Prevention. Juicing helps you consume more vegetables and fruits in a convenient, drinkable form. This boosts your intake of micronutrients and phytonutrients, helping to strengthen your immune system and ward off chronic illness. If you decide to add natural juices to your regimen, drink the fresh juices directly after they are made for the best health benefits. Natural juices are subject to both bacterial growth and rapid nutrient loss, reports CNCA Health. In addition, fresh juices made primarily from fruit are high in sugar and calories and may defeat your health goals. CNCA Health also warns that juicing too much of certain vegetables, like oxalate-rich leafy greens, can impair kidney health. Eat fresh raw and cooked produce in addition to juicing -- your body absorbs some nutrients, like the beta carotene in carrots, better when the veggies are cooked and not raw.